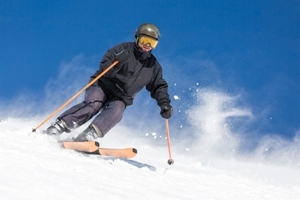 Does Experience Eliminate Your Risks for Suffering a Skiing Accident? According to the National Ski Areas Association, the majority of skiing fatalities occur as a result of skiers overestimating their skill levels and participating in high-risk maneuvers and behavior. In other words, skiers who believe themselves to be experienced are often the ones who place themselves in danger. In fact, a recent study conducted in Colorado discovered that 31 percent of ski fatalities occur on “expert” trails as a result of skiers losing control, colliding into trees, or suffocating in unmarked tree wells or preventable avalanches. Leonardo David. World Cup alpine ski racer from northwestern Italy who died as a result of complications due to a blood clot after falling at the end of his jump at the 1979 Lake Placid Olympics. He was in a coma for six years, until his heart gave out in 1985. Sonny Bono. Singer/songwriter, senator, and ex-husband of Cher, who died as a result of massive head trauma after colliding with a tree. He was considered an expert skier at the time of his accident. Michel Trudeau. The younger brother of current Canadian Prime Minister Justin Trudeau. Michel drowned as a result of being swept into Kokanee Lake by an avalanche while backcountry skiing in Kokanee Glacier Provincial Park. He was also considered an expert skier and swimmer at the time of the accident. Ronnie Berlack and Bryce Astle. Two young 2018 U.S. Olympic ski team hopefuls who died in an avalanche in 2015 while training in the Alps. If you succumb to a treacherous ski hazard and you believe your injuries could have been avoided if not for someone else’s negligence, there’s one more thing you need to know—the contact information for the Andrew Kim Law Firm, PLLC. If your injuries were a direct consequence of someone else’s action, you may be entitled to injury compensation. Schedule a FREE, no-obligation consultation today to see if your case has merit. Don’t allow another person’s mistakes to drag you down. Allow our experience and knowledge to help you stand tall. Call or contact us today! For more information on personal injury claims, feel free to browse our extensive collection of blogs, library articles, and frequently asked questions to get the answers you need. Who’s liable for my child’s injuries if he was hurt while sledding? Post a Comment to "How Experience Affects Your Skiing Safety"